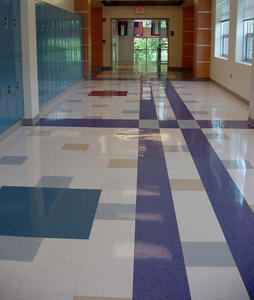 ​Does your business, church, hospital or school have VCT Tile? If so, Rock Hill Carpet Cleaners can help keep your Vinyl Composition Tile looking brand new. When walking into a business, your floors are one of the first things that people notice. VCT tile cleaning helps make a great first impression. Vinyl composition tile (VCT) is a finished flooring material used primarily in commercial and institutional applications. You would see this type of tile still found in the corridors of schools, churches, hospitals and office buildings. In commercial applications some tiles are typically waxed and buffed using special materials and equipment. Rock Hill Carpet Cleaners specializes in keeping your VCT Tile flooring shinny and clean. Are you looking for the best VCT tile cleaning service in Rock Hill, SC? ​Modern vinyl floor tile is frequently chosen for high-traffic areas because of its low cost, durability, and ease of maintenance. Vinyl tiles have high resilience to abrasion and impact damage and can be repeatedly refinished with chemical strippers and mechanical buffing equipment. We can strip and wax your VCT Tile floors to help preserve the life of the tile and keep them from getting dull and dingy. If properly installed, tiles can be easily removed and replaced when damaged. Tiles are available in a variety of colors from several major flooring manufacturers. Some major companies have created vinyl tiles that very closely resemble wood, stone, terrazzo, and concrete and have hundreds of different patterns. VCT tile cleaning helps preserve the life of your floor. We take great pride in keeping your VCT Tile looking great! Give us a call or fill out the form on the right side of this page and we would be happy to take a look at your VCT tile flooring. All cleaning companies are not the same. We specialize in stripping, waxing and buffing your tile floors. We can clean your tile floors once and they will look great! But, with our experience, we have learned that after stripping and waxing your floors, having a regular buffing maintenance schedule will keep your floors in tip top shape. VCT tile cleaning is an investment worth making. We want to earn your business and we will strive to do the best job possible. Give Rock Hill Carpet Cleaners a call today at 803-594-4494.